Naomi is a treatment coordinator who oversees our five surgeries, making sure appointments are running smoothly, and as clinical nurse manager she handles the clinical checklists and organises the nurses. The most important aspect of her role is to ensure a smooth and stress free patient journey for all new and existing patients at Portmore, and she is responsible for the ongoing training and development of the nursing team. Naomi is the first point of contact at the practice for patients wishing to discuss treatment, finance or any other aspect of their visit to the practice. 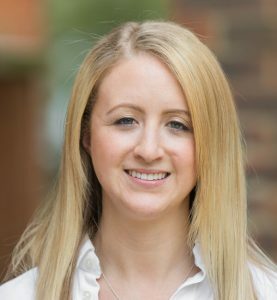 All of our new patients will meet Naomi before seeing a dentist, and she has the time and experience to discuss your dental needs and explain the treatments and services that we offer at the practice. Her approach is calm, kind and organised, which means that she is the ideal person to guide patients through their treatment at the practice. Naomi likes a challenge and enjoys developing her skills, most recently completing the ILM Level 3 certificate in Leadership & Management. She received her National Diploma in Dental Nursing in 2013. Outside work she enjoys socialising with friends, spending time with family and keeping fit by going to the gym.